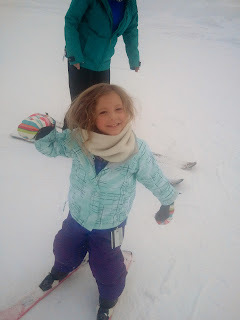 I've been having issues with my photos which is preventing me from sharing all the over the top skiing cuteness that is Ava. After way more work then it was worth I was able to salvage some of the photos that were feeling lost to me. Without further ado, here is our skiing pro. Saying bye to Norah. ready to hit the slopes. She zips down the hill, weaving through all the less confident people around her. See that lady pointing to Ava? Many parents & instructors were using her as an example to motivate their little skiers. Norah has been the trickiest part of all this fun. While Ava skis what do you do with Norah? Usually I just stay home wit her but this time I let her wander around in the snow. Either way, I don't get to ski. I'm still learning myself so I cant really take Ava. Oh well, Norah sure is cute! The other day I finally got around to making this Cauliflower Crust Pizza I have been dying to try. In a word? I crave it all the time now and it's just so easy to make! And sort of healthy!! You just "rice" a head of cauliflower, mix in some low-fat mozzarella, egg & some spices and form into whatever shape your heart desires (what an easier way to make heart shaped pizza in the future!!) and bake. Then add your sauce & toppings and broil for a few minutes. I topped ours with a mixture of sauteed mushrooms, onions & garlic as well as Greek olives, artichoke hearts, red bell pepper, feta, spinach & Parmesan. Oh my! You seriously need to try this!! First swimming class & then back to the mountain. Lets hope for the perfect snow conditions! I haven't even unpacked yet, aside from pulling a few things out to wash. It's pretty much a whirlwind, trying to figure out what to cook & such. I am super excited about this trip, it looks like Billy & her family will be joining us. Love them, can't wait!!! I feel like every post could be titled that way for quite some time. 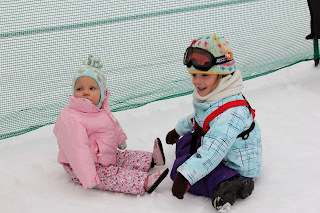 Mom got Ava & I Spring ski passes so we will be spending as much time as possible up on the mountain, getting our ski on. 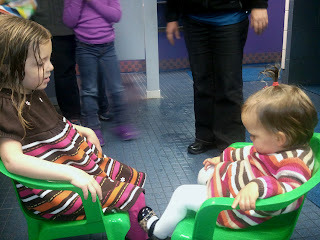 Watching my girls hold hands melts me heart. Norah is working on mastering fork food, she thinks it's hilarious. Love, love, love Ava's messy hair! We got right back on the horse. Even though everything was going wrong on Wednesday and we had made no plans to go skiing on Thursday, it was just so beautiful out that we decided to give it a go. I had a much better feeling this time, but I am me, so I still had my typical optimistic skepticism going. We decided to try the rental place across the street this time. I guess Mom prefers that one, we had only gone to the other one the day before because I was standing in front of it, waiting for Mom, so it just ended up that way. I liked the first place, they gave Ava super short red skis and cute white boots. She just went with it, even though she really does have an opinion about everything, especially colors of things. Anyhow, this guy, at this new place, must of really GOT IT. He saw her coming or something, he brought her out the pink skis with unicorns on them, pretty much her dream skis really. Let's Get Rid of ALL Their Toys!! !